I’m going on a “little” walk. When specific memories of Julian pop into my head, they usually make me smile. Sometimes they remind me of not just the memory itself, but who he was as a person. And every once in a while, something triggers a memory that not only makes me smile and remember the person he was, they teach me something about myself today. One of those memories, of all things to be one of those memories, is of his potty-training process. I’d heard (or maybe just hoped) that the second child is usually easier to potty train than the first child, because he’d be motivated to be a “big boy” like his brother. As we began the process with Julian, I thought back on how it went with his big brother, three years earlier. And then he walked out of the bathroom. There would be no compromise. He understood his options, and he made his choice: Little. As a person who has spent most of her life being goal-driven, I was perplexed by this. He just didn’t want to move on to the next milestone in his growing-up process. And he wasn’t giving me any excuses or explanations, either. Thinking back on this today, not only can I smile at the memory, I can be inspired by him. Over the past few months I have been on a bit of a growing-up process myself. In some areas of my life, I’ve been working hard to un-goal myself. In other areas of my life, I’ve been trying to set new types of goals for things I’ve never done before. One of the things I’ve never done before is run a 5K. So about 3 months ago, I decided I’d run in the “Time to Fly” for the Children’s Cancer Research Fund. We have a team that runs (and walks) in memory of Julian — “Joggers for Julian.” I figured, what better motivation could there be? I’d do something I’ve never done, and I’d do it in honor of Julian. I registered for the run, told my friends and family my plan, and started a training program. At first, the training went fine. Then, not so fine. Then, I started getting really stressed about it. But I continued to slog my way through the training program, because I said I was going to do it (dammit!). Most of the time, I forget that “little” is an option. But Julian didn’t forget that. He knew what his options were, and he knew himself. He was resolute and uninfluenced by bribery or peer pressure. He understood that he was supposed to want to be big, and he probably recognized that big-ness was inevitable. But not yet. Not that day. So, I let go of the running goal. I decided I no longer wanted to be “big” and run the 5K. I wanted to be “little” and just plan to walk the 5K with my friends and family. In the past, I would have been very critical of myself for making this choice. Today, I smile and think of Julian. I’ll be thinking of him every step of the way on my 5K *walk* this coming Saturday. And from that point on, he was potty trained. Because he decided. He just… decided. Maybe someday I’ll decide to run the Time to Fly 5K. But not this year. This year, I’m going on a “little” walk. The event on June 30, 2012 was a wonderful celebration of Julian’s memory. We were overwhelmed and honored by the huge outpouring of support in the form of donations, participation, and encouragement. We had over 50 people participate on the Joggers for Julian team, and we won 3rd place in overall donations with a grand total of $13,675 raised for the Children’s Cancer Research Fund. My husband John also won 2nd place for individual donations. 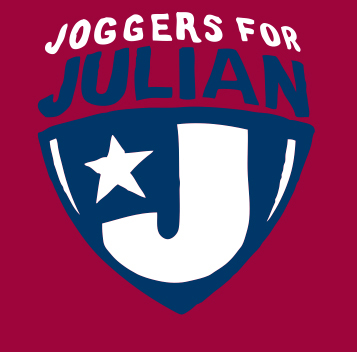 There was also a “Joggers for Julian – Ohio” event organized by my cousin Mary Catherine, and there will soon be a similar event in Connecticut organized by John’s family. THANK YOU to everyone who contributed — financially, physically, and emotionally. And last but not least, thank you to Julian for being such an inspiration to those who knew him, those who never met him but have heard his story, and to me. I thoroughly enjoyed every step of the *walk*!